Sierra Leone's Mohamed Kallon, has joined Saudi Arabian club Ittihad on a years loan from French club Monaco. Kallon still has three years left on his contract with Monaco. But according to Tunde Scot manager of Kallon's team in Sierra Leone - Kallon FC - he has fallen out with Monaco coach Didier Deschamps. "I'm in constant touch with Kallon and he's prepared to leave Monaco because his relationship with Deschamps is sour," Scot told BBC Sport. "He's being offer a contract worth around US$3.6m, which I believe is attractive." 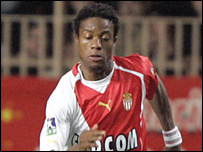 Kallon joined Monaco last season from Inter Milan and scored 11 goals in 34 league games.